Our professionalized service and record of excellence over the years have established a reputation of trust and fairness in both US and China, which many of our clients have come to depend upon again and again. In 2012, we strategically opened our offices in the tier one real estate markets which are New York, Seattle, San Francisco, and Los Angeles, and gained the first-mover advantage. As the business growing, we launched another two offices in the tier two cities, Boston and Hawaii in early 2017 and were planning to expand significantly in the next three years. Our exclusive partners, “Beimeigoufang.com” (北美购房网) and “house.sina.com” (新浪房产) are two most influential real estate web portals in China, which provides us signif- icant exposure in the Chinese-speaking market. Engaging NAREIG will employ our ever-growing leading-edge online marketing platforms, generating over 3,000,000 unique visitors per year and over 40,000 followers on our social networking sites. Through the years, we brought experts who were specialized in dealing with Chinese clients together in major US cities and formed an extensive network of resources that no existing companies can compete. Our extensive referral network (such as closing attorneys, mortgage consultants, contractors, designers, movers, etc.) will provide what Chinese investors may need for a smooth and successful process. 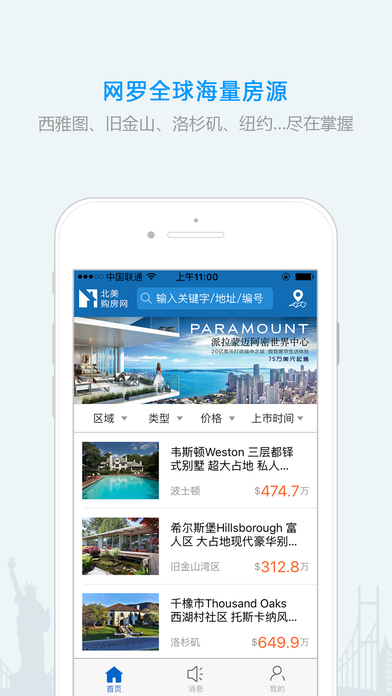 Through our exclusive global partner “Beimeigoufang.com” (北美购房网), we formed a unique online-to-offline (O2O) business model that connects millions of Chinese-speaking clients with prestigious properties and investment opportunities, and provide them true one-stop, worry-free experience. Our brokers are more than realtors involved in a simple transaction. They are bilingual real estate consultants who understand the market, the culture differences between China and the US, and Chinese investors’ rationale of purchasing. They are able to quickly identify clients’ needs, concerns, and utilize their rich knowledge to connect investors with great properties or opportunities. Our commercial real estate team is a market leader in achieving diverse objectives of Chinese clients throughout major US markets. Whether it be office, retail, or industrial space; real estate syndication; property management; or land development, our local knowledge, technical resources, strong relationships with American commercial real estate companies, and thorough understanding of Chinese investors’ needs and concerns provide our clients with vital information for making successful financial decisions in their pursuit of commercial real estate. We are first and foremost clients marketing agent as much as it is their sales broker. In order to achieve the highest price possible in the shortest amount of time we build our in-house marketing team instead of relying on external marketing agency or services. We embark on advertising and marketing campaigns in all media to ensure maximum exposure for the property. Those online and offline channels include industry trades, real estate portals, multiple listings systems, glossy publications, broker networks, social media, search engine optimization, direct mailing campaigns and much more. In 2014, we launched a mobile application called “Beimeigoufang” (北美购房) that dedicated to innovating the way brokerage services are provided to Chinese-speaking clients through brokers. is APP brands the independent broker as a sole point of contact to his or her clients through feeding real time public and o -market listings. By having this proprietary asset, we hope to have the most efficient and best-equipped brokers in the industry.